When seniors age, their skin gets thinner, and the skin surface is more likely to tear. Some seniors have skin that breaks easily even when doing basic things like removing an adhesive bandage, and these wounds can lead to a lot of discomfort and distress. 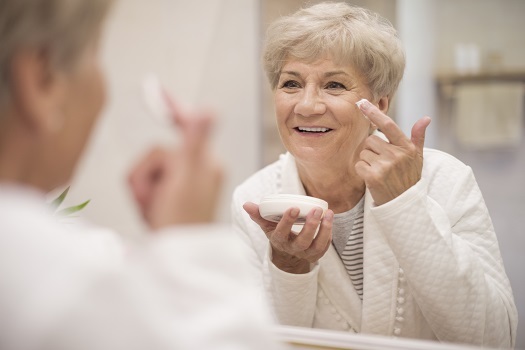 Here are a few things you can do to prevent and treat your senior loved one’s skin tears. The first thing you should do when your loved one tears his or her skin is rinse the area with water or a saline solution. Gently pat the skin dry, but avoid rubbing the area or putting pressure on it. If the tear results in a skin flap, leave it attached and smooth it gently back into place. To promote healing while protecting the wound, use a wet dressing like a film dressing or petroleum jelly gauze. Check it every couple of days to ensure there’s no infection, but be careful not to reopen the wound while it’s healing. Some skin tears can be quite severe, so make sure to seek medical attention for large wounds, tears that won’t stop bleeding, or infected tears. Skin tears and other injuries can affect quality of life in the senior years and make it difficult to perform everyday tasks. Some seniors only require help with a few daily tasks so they can maintain their independence. However, those living with serious illnesses may need more extensive assistance. Luckily, there is professional live-in care Sacramento, CA, seniors can rely on. Home can be a safer and more comfortable place for your loved one to live with the help of an expertly trained and dedicated live-in caregiver. Many skin tears are caused by dry skin that breaks instead of stretching when force is applied. You can help your loved one’s skin regain some elasticity by keeping it moist. Apply a fragrance-free moisturizer twice a day to sensitive areas to greatly reduce the chances of skin tears. Pat the moisturizer into the skin instead of rubbing to avoid putting too much pressure on the surface. Remember the process of moisturizing the skin is both internal and external, so encourage your loved one to drink adequate amounts of water. Consider the types of incidents that lead to skin tears, and take steps to prevent them. In some cases, preventing a skin tear may be as simple as shifting furniture away from areas where your loved one is likely to run into it. You can further minimize accidents by adequately lighting rooms and putting padding on the edges of rails and corners. It can also be helpful for seniors to wear clothing that covers most of their skin to provide an extra protective layer. Research has documented an association between skin tears and lifestyle factors such as limited mobility. There are a variety of age-related health conditions that can make it more challenging for seniors to live independently. However, many of the challenges they face can be easier to manage if their families opt for professional elderly home care. Sacramento families can rely on expertly trained caregivers to keep their loved ones safe and comfortable while aging in place. Many skin tears can be prevented by taking a little extra care when repositioning, bathing, or dressing your loved one. Whenever your loved one is participating in such activities, take plenty of time and avoid rushing. Always avoid pulling on the skin. Instead, any contact should consist of gentle patting motions. Use an adhesive remover when removing bandages to avoid putting pressure on the skin. The risk of sustaining a skin tear increases significantly as the skin becomes weaker, drier, less elastic, and thinner due to decreased subcutaneous fat, collagen, elastin deposits, and sebum gland secretion that comes with aging. If your elderly loved one is living with a serious medical condition and needs help managing the tasks of daily living, reach out to Home Care Assistance, a Sacramento home care agency you can trust. Our caregivers are available 24/7, there are no hidden fees in our contracts, and we offer a 100% satisfaction guarantee on all of our in-home care services. To create a customized care plan for your loved one, give us a call at 916.706.0169 today.